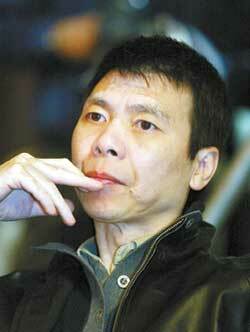 Feng Xiaogang is a Chinese film director noted for his humorous films and New Year celebration films, which have won him many fans. Feng was born in Beijing in August 1958. He has been interested in art and literature since he was a child. After graduating from high school, Feng worked in the Art Troupe of Beijing Military Command as a stage designer. Later he joined the army. In 1984 he was transferred to the trade union of the Beijing Urban Construction and Development Corporation, where he worked as a secretary in charge of recreational activities. In 1985 he was transferred to the Beijing TV Art Center where he was promoted to an art director. In the late 1980s he was introduced by his friend Ge You to the Shanghai Film Festival, where he formally began his film-making career. The first film Feng wrote and directed was "Unexpected Passion" in 1991. It had four nominations at the China Golden Rooster Awards, the most revered awards in Chinese films. In 2001, his movie "Big Shot's Funeral" won Best Film at the Hundred-Flowers Awards, a prestigious award chosen by audiences, while "A Sigh" took home Best Film at the Cairo International Film Festival. Feng won a Golden Rooster award for Best Director for his 2007 film "The Assembly." One of his latest films, "Aftershock" took home three awards at the 2011 Asian Film Festival, for Best Visual Effects, Highest Box Office and Best Actress. Feng's New Year celebration films have become a brand name in the past years. "The Dream Factory" (1997), "Be There or Be Square" (1998), "Sorry Baby" (1999), "Big Shot's Funeral" (2001), "A World Without Thieves" (2004), "If You Are the One" (2008), and "If You Are the One II" (2010) have made him the most prolific director in Chinese mainland. "If You Are the One II," which brought in 600 million yuan at the box office, established him as the king of the Chinese box office. Critics have said that Feng has found a way for the commercialization of national cinema and injected vitality into a sluggish Chinese film market. Feng's writing style is humorous and full of wit. He is particularly celebrated for his comedies written in Beijing vernacular about Beijing people and their ways and customs, especially in the TV series "Stories From the Editorial Board" in 1991, which catapulted him to fame. Critics say Feng's creativity and strong financial resources are a trend for mainstream Chinese film and TV culture. Feng was born to a non-wealthy family in suburban Beijing. His father was a college professor and his mother was a factory nurse. His parents divorced when he was very young. He was brought up by his mother and sister. Feng married a nurse in 1984 and divorced in 1999. The same year, Feng met and married actress Xu Fan (徐帆). Feng has a daughter from his first marriage and adopted a daughter with Xu in 2009. Feng has suffered from vitiligo and heart disease for many years. Constant overworking caused him to faint during a CCTV interview. "I am a director from citizens. My movies are based on the perspective of citizens, to perform the aspiration of citizens, and to live up to the expectation of citizens to the full," Feng has said.